As Mary and I sat down at the end of the year and reviewed our blogs, we wanted to start doing a series of sorts on Fridays. Over on 17 Apart, we have always enjoyed recapping our Weekend Basics on Mondays. My new feature, Feasting on Friday, will be a scrambled egg approach to food related finds with some other things tossed in that I come across. 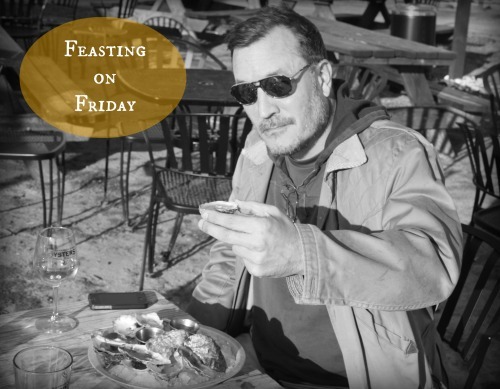 So here goes with the inaugural post — I hope you will let me know if you find something of interest here on Feasting on Friday! -Search for restaurants that have been featured on TV shows from the Travel Channel, Food Network, and others. Here are the restaurants that have been featured in Virginia. -Is Instagram causing you anxiety? Check out, the agony of Instagram. The one guy that causes me angst in a good way is William Hereford, because his photography and subject matter is so damn good! -Which view is your favorite from Travel + Leisure world's best restaurant views? -Writer's block? Here are 10 wonderful tips to get those writing juices flowing! -Everyone needs a kitchen medicine poster. -It really is ok to play with your food, really. -Food packaging you can eat? That and other food trends in 2014. -You want stats — here are 124 fascinating social media statistic and figures from 2013. -A different look from National Geographic, tips on photographing food. Hoping your weekend is tasty. P.S. If you are interested in the new series on 17 Apart its called Fancy That — you can find it here.